« Really Interesting Post by Star at Pantheon. One of my favorite gifts this holiday season came from my grandmother. It was a bag filled with mementos, heirlooms, and books. The books came from my grandmother’s shelf – things she felt we would be interested in but that she has no need for anymore. She gave me some titles on food preservation and herbalism. I’ve been reading the red book in the photo. It’s full of useful herbal recipes that I can’t wait to try! There were also several photos of family members, some of whom have passed through the veil. The beautiful photo above features some great grandparents and great, great grandparents! I love the clothing they were wearing and can’t wait to frame this. It’s a lovely addition to my ancestral shelf. 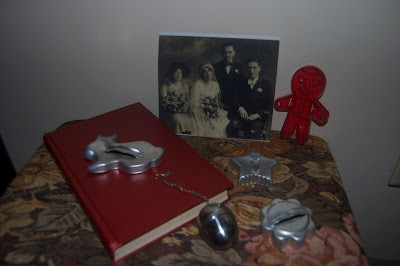 I was thrilled to receive the antique cookie cutters. I remember using them when I was little and now some are mine to treasure! I can’t wait to make some rabbit and flower cookies for the Spring Equinox! Grandma also included a favorite recipe – bran muffins. They were a favorite treat when we went on vacation. Also photographed was my great-grandmother’s tea ball. I’ve been needing another and now I can sip tea with my ancestors using one of their treasures! Passing information and tools down through the family is a sacred act. It preserves tradition and honors the ancestors who passed them on before. I hope that I can pass them on one day. Truly, what could be more meaningful than sharing ancestral gifts during the Yuletide season?